I’ve been reading a lot of Osprey books this year for a number of reasons. I have managed to collect a lot of them over the years and they are quick easy reads. Also, I am determined to finish more books this year than Jim Bates and the Osprey books are an easy way to boost my book count. The format of these books is pretty much all the same, a short history of the subject aircraft, 8 or so pages of color side views and some combat stories with quotes from the participants. So of the books are better, such as the Nick Millman volumes on the Ki-27 and Ki-44 aces, and others aren’t quite of the same caliber. Sadly this volume falls into the latter category. The book isn’t bad, per se. It’s not that author has gotten anything factually incorrect, as far as I can tell. I did learn some stuff too, such as the USMC RF-8 units never operated the RF-8G, only the RF-8A. Also, part of the problem may simply be the subject itself, as recon flights don’t lend themselves as easily to the “There I was..” type of gripping combat stories. On the plus side, this volume seems to contain more than the normal number of photographs for an Osprey book, though quality of the reproduction of the photos leaves something to be desired. Given that the RF-8s were operated by the Navy and Marines from the early 60s to the early 90s, the color side views, the centerfolds of the Osprey series don’t provide much variety, all of them being some variation of gull grey over white. Only the colorful squadron markings provide any variety and the recon birds were less colorful than their fighter and attack brethren. If a modelers is looking for inspiration I highly recommend Blue Moon over Cuba detailing the RF-8 flights over Cuba during the missile crisis. While this book makes an interesting companion to that book, I am not sure that it really adds much. 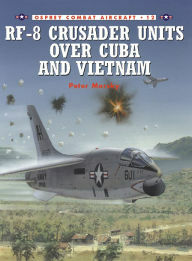 I was able to pick my copy RF-8 Crusader Units over Cuba and Vietnam used off of Amazon, so it only coast me about $5 including shipping. While race planes aren’t my thing, I may have to get this just because it is from SBS. Story here. The Chinese will lose more and more control over their currency the deeper they move into the international market. Infantry units with silenced weapons. How did the Royal Navy end up like this? How could the United Kingdom let this happen to their navy?